Beginnings are always exciting, daunting but tinged with a slight edge of anticipation. While I've (un-creatively) titled this Style Bite #1, this is not the first time I've posted about outfits. 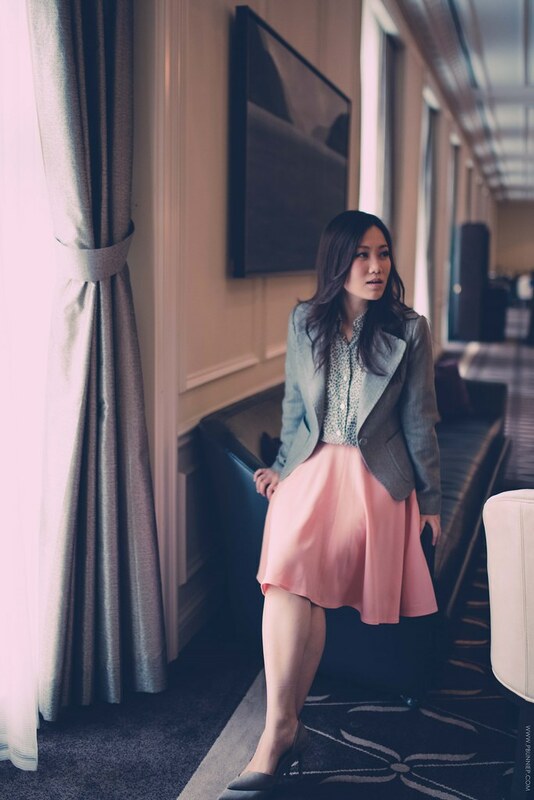 For those long following my Youtube channel, I occasionally post short snippets of outfits in video form but I do love the subtle detailing of photography and thus, Style Bites will be my version of daily outfits and pairings, shared with you here. 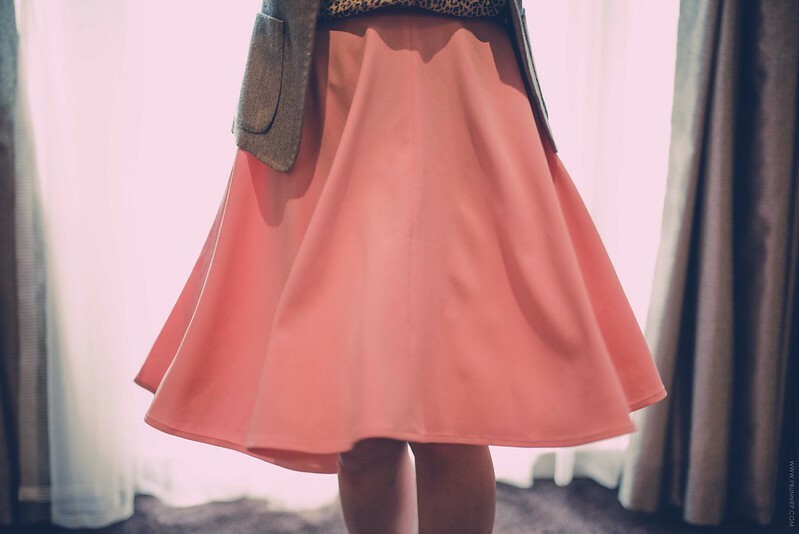 This entire outfit really revolves around this lovely skirt. Non-descript as it may seem, this is actually the very first item I've completed in my Wardrobe Architect Sewing Challenge ; there is so much sweat and labour behind its peachy exterior. 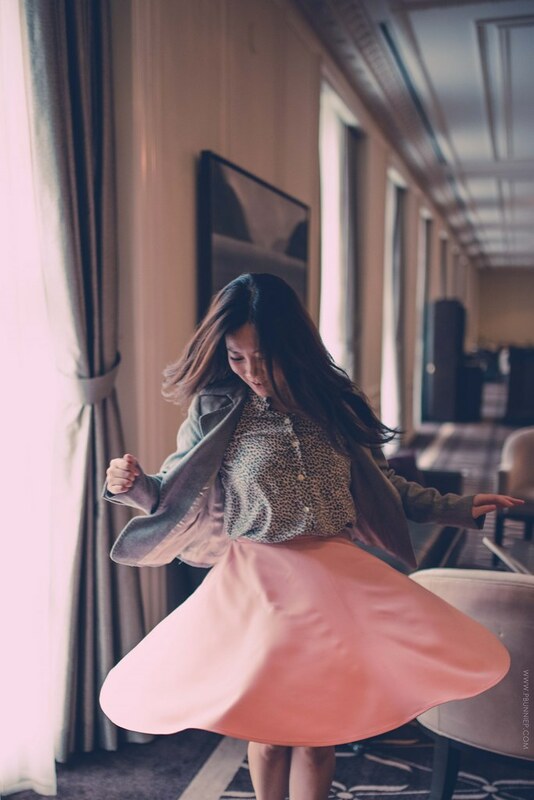 Cut from a stretch cotton twill that has great drape, this skirt has a 4 gore construction that makes it just short of a circle skirt with plenty of swing. 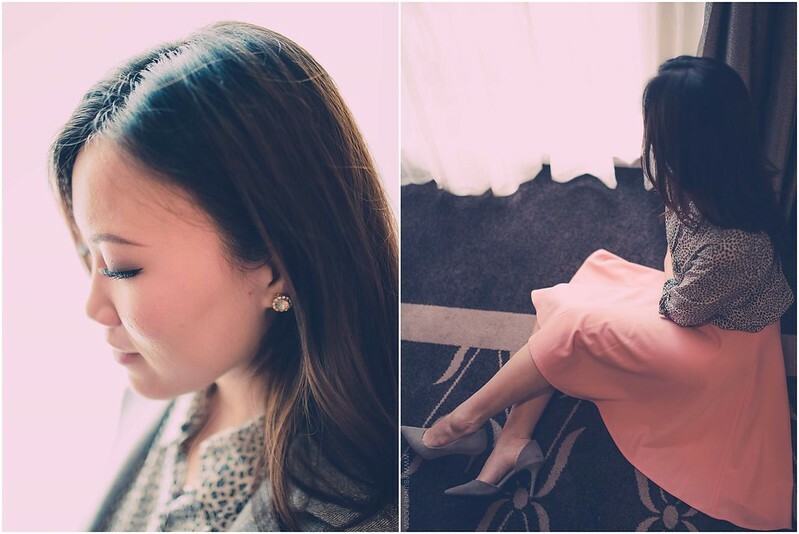 As the day called for some fall beauty previews (more exciting new about that to come) in the luxurious and classic Hotel Georgia so I wanted a softly textured outfit that had the same allure. Grey shades are an excellent match with pastels but it looks especially sweet with peach or pink. 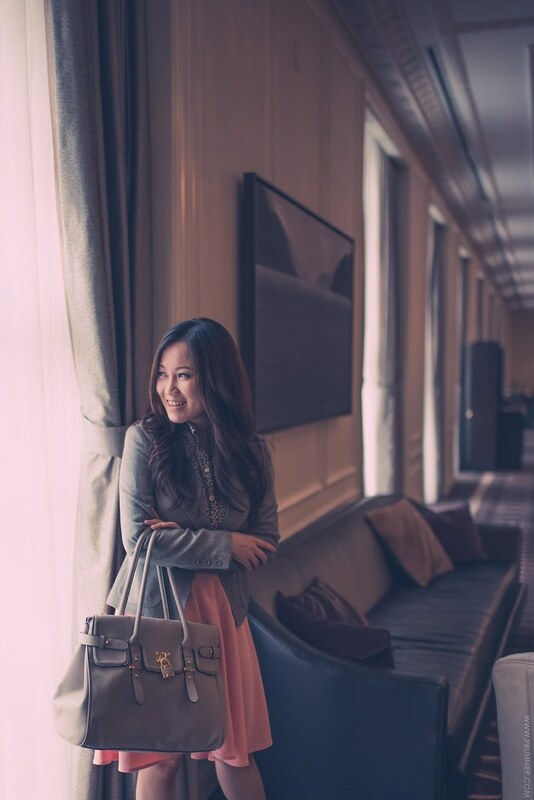 Since I don't tend to wear a lot of jewelry, I love wearing clothing with textures and subtle patterns instead. I adore almost anything with a leopard print but this grey variation in silk is soft enough not to be intimidating and you'll see me don this often when I'm in need of something more put together but not uptight. Another classic piece here is the grey herringbone blazer that feels soft as a sweater while still giving a good nip at the waist and shoulder definition. One of my goals with this year's sewing projects is that I wanted to make them right, with attention to detail and technique versus a speedy finish. 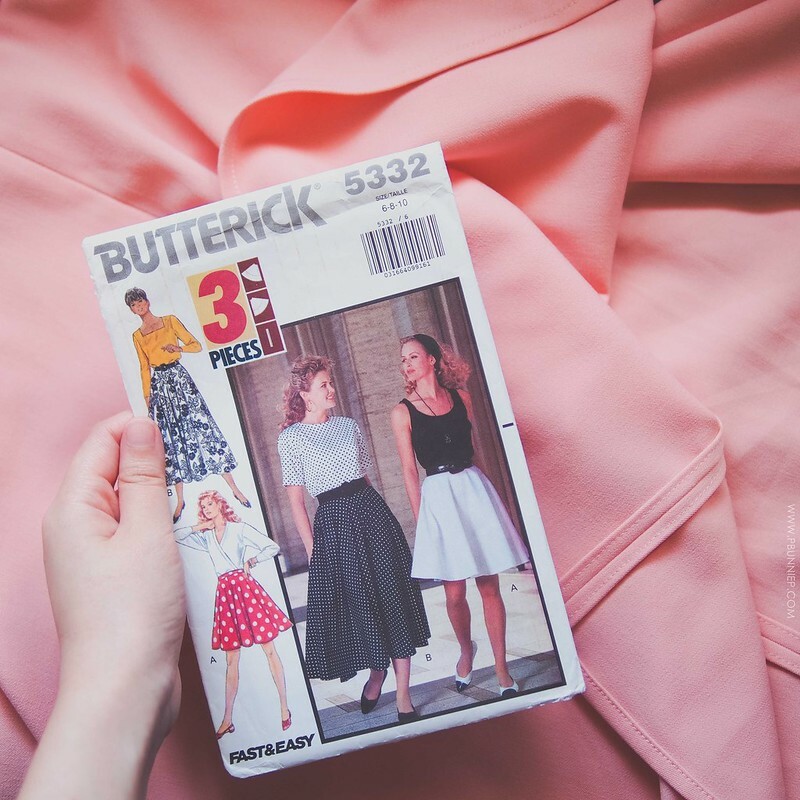 The pattern I used is a vintage 80s Butterick piece, which although the styling on the cover art isn't my personal taste, I knew the skirt on its own can be reworked in many different ways. In my recent sewing experience, I've really grown into the idea that it's more important to see the potential behind a pattern rather and its shape rather than the decade it comes from. One thing I am incredibly proud of in this skirt is that I took the time to treat each inner seam to an under turned stitch instead of the regular zig zag (this is the part when I'm wishing really hard for a serger). Because the skirt had only straight lines at the connecting panels it was no problem and this technique gave it a really clean and high-end finish. On the flip side, I'm still getting the hang of hook and eye closures which doesn't seem to sit flat at the back and my zipper installation could still use some more practice. For more on my Wardrobe Architect adventures and to see my planning process from this piece, follow along here. I'm definitely hoping to wear this into fall with boots and maybe even do this skirt again in a satin back crepe in the long length version. Navy blue anyone? Let me know how you like this skirt and better yet, if you'd wear it yourself!